India has not done anything much in offshore wind energy installations with other countries such as China, USA and Germany already planning or setting up large offshore wind energy farms. India is now setting up the foundations for the growth of offshore wind energy in India. The country has a vast coastline and there are good potential sites to set up large wind farms off the coasts. They are mainly located off the shore of Gujarat and Tamil Nadu. Both these states are the leaders in onshore wind energy installations, with TN accounting for 50% of the country’s installed wind energy capacity. Gujarat has also shown spectacular growth in recent times and top wind turbine manufacturers hail from this state. 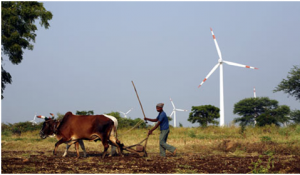 Read about more Wind Power in India. Gujarat government has shown interest in offshore wind energy and tidal barrages in the past, but nothing has come out from that initiative. Now the Ministry of Renewable Energy (MNRE) plans to set up an Authority which will help conduct studies on the potential of offshore wind energy in India, as well as enter into contracts with developers. I am not sure how successful this will be, given the plethora of ministries that a developer will have to tackle to get clearances for wind farms. Note India’s power developers face huge red tape in getting clearances for normal thermal power plants. For offshore wind energy farms, developers will have to get approvals from Ministry of Defense, Coast Guard, MHA etc. Also offshore wind energy is currently not competitive in terms of costs requiring large initial investments. Setting up the grid and the necessary supply chain will also take some time. My take is that we will not see any offshore wind farm in India at least in the next 5 years, given the country’s current situation. It will take some serious initiative on someone powerful to make this happen and I cannot currently see this happen soon.